Using advanced ASUS laser technology, precision mouse control on almost any surface becomes easy and natural, even on glass. With customizable resolution and function buttons, you can tailor the WX470 to your specific requirements and applications, switching between tabs in Windows® 7 instantly using the Aero Flip 3D button. Plus, the hand feel here is superb, specifically crafted to ensure enduring comfort whether gaming or drafting a critical presentation, made better with a nano receiver and long-lasting battery that extends time between charges. Precise cursor control on almost any surface, even glass! With advanced ASUS Laser Tracking technology, you get better precision on a wider range of materials, including glass* and high gloss or lacquered surfaces, where standard optical and laser mice dare not go. For the WX470, these are no obstacle. What is ASUS Laser Tracking Technology? 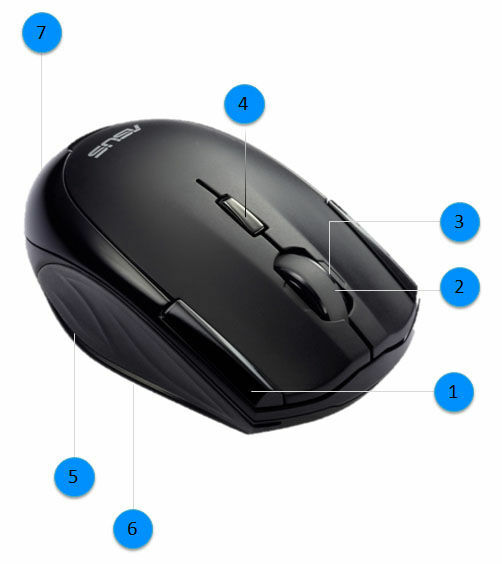 ASUS Laser Tracking mice can go virtually anywhere, utilizing LaserStream™ technology, which enables mouse tracking on almost any surface, including glass and lacquered desks that leave optical mice and standard laser mice lacking. This technology detects the smallest details to create a micro road map of the surface, so you get better precision on more materials. 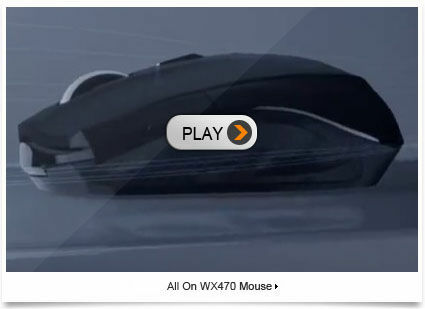 The WX470 works with up to three AAA batteries, but users can place just one or two batteries for a lighter mouse and a better hand feel based on personal preference. One simple and easy button press switches between tabs and windows, making web browsing, video watching, and word processing much easier with instant multitasking. Resolution switching between 1100dpi and 1600dpi. Tilt wheel 4-way scrolling: easily move pages right to left! Wrapped in sweat-resistant rubber coating to keep hands feeling clean and fresh. Makes it possible to keep working and enjoying in almost any location!